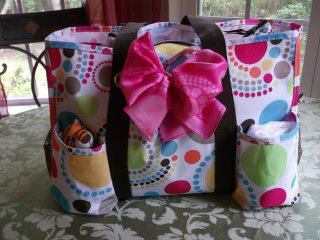 Being Frugal and Making It Work: Thirty-One Gifts: Utility Tote Giveaway - Makes a Great Diaper Bag! Thirty-One Gifts: Utility Tote Giveaway - Makes a Great Diaper Bag! Are you looking for a functional tote bag that is also stylish? I have an amazing organizing utility tote from Thirty-One Gifts and I absolutely love it! This great tote comes in 10 stylish and fashionable designs, I have Paparazzi Dot! They are durable and functional with unlimited uses. A funky diaper bag, fashionable purse, spacious craft bag, stylish beach bag or even for your grocery shopping! My 8 year old daughter thinks it's perfect to carry her toys around in and has tried to steal it from me on numerous occasions. The organizing utility tote lets you organize in style with plenty of pockets! This hot-selling item helps make your life easier! And how many of you can say that you couldn't use that in your life? The fabrics are fun and stylish in addition to being made to stand up to everyday use. They also have a stain and water resistant lining making them perfect for any job! This giveaway will end July 22nd at Midnight EST. Disclaimer: I rwant to thank Bea's Gifts Too for providing a Thirty-One Gifts tote for this giveaway. I only recommend products or services I use personally and/or believe will be a good fit for my readers. The views and opinions expressed on this blog are purely my own. Results may vary. No monetary compensation was received. I like the black happy dot pattern. I like the FLUTTER design. I love the Black Parisian Pop. I love the minty chip pattern! I like the Flutter butterfly print. I really like Lotsa Dots! I like the Black Quilted Poppy. Love the aqua circle! Thanks! I really like the awesome blossom pattern. I thought the idea for the New Spirit collection was way cool too. I like the Aqua Spiral Circles.Lots of cool bags.Thanks for the cool giveaway! I like Black Parisian Pop! I like the "best tweets"
I Like #3612...Expand a Tote. My favorite pattern is the Circle Spirals design. Aqua Spiral Circles in the organizing utility tote! I like the colorful Circle Spirals pattern. I haven't seen Minty Chip before--that's cute! Circles/Spirals is my favorite pattern. Cindy tote in black parsian pop. I love the Awesome Blossom print.